The San Fernando Valley is one of Los Angeles' most attractive areas to in which to live and work – but no place is any fun when you're sick. 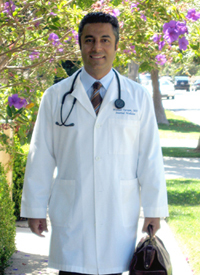 When you need outstanding urgent care in Encino, Sherman Oaks, Tarzana, or anywhere else in the Valley, Dr. Michael Farzam of House Call Doctor Los Angeles is here to provide you with the kind of personalized care that many of us assume no longer exists: a first-rate on call doctor who is ready to care for you at your home, office, or worksite. The kind of urgent care Encino and San Fernando Valley residents typically encounter is usually based out of a clinic. Most of these offices provide decent care, but they all require patients to make their own way, often through heavy traffic, and there is often quite a long wait involved once patients arrive. This may be somewhat difficult even when people are feeling well; when you're sick, it can be the very opposite of therapeutic. The good news is that Dr. Farzam provides outstanding at-home urgent care in Burbank, Glendale, North Hollywood, Reseda, Woodland Hills, and the entire Los Angeles area. Even so, he is careful to treat each patient as the individual he or she is. Patients laud him for the personal touch he brings to general medicine, but what surprises most people is how reasonable his charges are. With Dr. Farzam, at home urgent care in Encino and everywhere else is often significantly less expensive than a typical emergency room visit when patients are not fully covered by insurance. Still, the most important aspect of working with any physician is your overall quality of care. Even among the very, very few practicing house call doctors, Dr. Farzam is simply one of the best. For the kind of outstanding urgent care Encino depends on, call 310-849-7991 today or visit the House Call Doctor Los Angeles contact page.